I Love Freestyle Music Tour. This Saturday, March 23, come on out and jam out with the best of Freestyle. Kicking it old school. 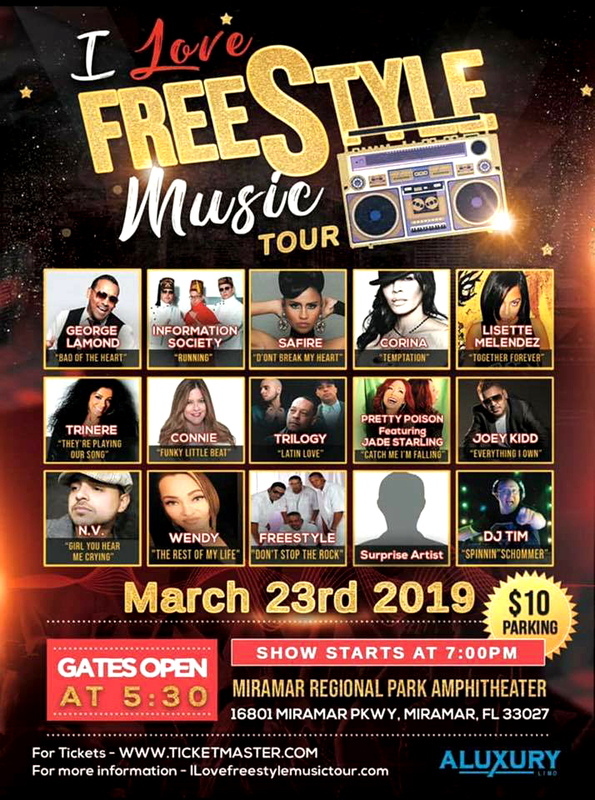 Featuring: Connie, Information Society, George Lamond, Wendy, N.V., Corina, Lisette Melendez, Pretty Poison (Featuring Jade Starling) Joey Kidd, Safirre, Trilogy, Trinere, Freestyle, Surprise guest artist and spinning the turn tables, DJ Tim. Show starts at 7:00 pm. Miramar Regional Amphitheater. 16801 Miramar Parkway, Miramar, FL 33027. Gates open at 5:30 pm.